Since early 2004, Frigorifer has constantly invested over EUR 10 million in upgrading its production facilities and equipment. Hence, Frigorifer has become one of the most advanced frozen vegetable factories in Eastern Europe, with a production capacity of 100 tons/day. • Eggplants, with a capacity of 32 tons/day. The line incorporates equipment for both cooking and freezing eggplants. 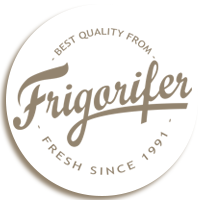 Frigorifer has a portfolio of private brands – Edna and Casa Ţărănească – but also produces food for a number of international retailers; Carrefour, Artima, Billa, Metro group, Penny, Auchan, Mega image and others.